An ultra green, lush lawn doesn’t happen overnight… that is, unless you opt for sod installation. But that’s not what we’re talking about here. We’re talking about turning your mediocre lawn into one that’s lush and green. To make that happen, you have to fertilize. 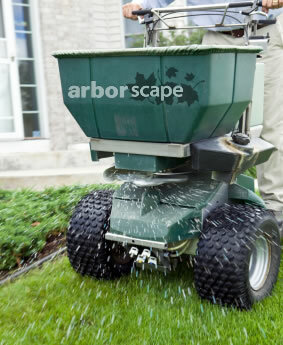 A fertilizer schedule for certain periods of time during the year is essential to keep your lawn growing consistently green and luscious all season long. Our lawn fertilization services are typically built into a lawn maintenance program designed specifically for your needs. The program would include everything your lawn needs to thrive and look fantastic. Can We be Hired For Lawn Fertilization Only? The answer is yes, we can be hired for stand alone lawn fertilization services but it’s rare. Most of our customers opt for a maintenance plan that includes our full range of lawn care services, a great value. How Much Fertilizer do You Need? A typical lawn will need about 6 pounds of nitrogen a year. We like to do 6 applications of fertilizer per season. This helps your lawn maintain its vigor and look great. The healthier the lawn, the less likely it will be vulnerable to disease and pests. Fertilizing is just part of the story. Mowing is a huge factor in maintaining a greener, healthier lawn. The golden rule of grass cutting is to never cut more than a third of the total length of the grass blade. Basically this means… don’t cut your grass too short. This stresses your grass and depletes the reserves it needs to pull through rough times. Like when the sun is ultra hot and rain is scarce. Our lawn pros know the proper height to cut your grass for optimal health and growth. We do a lot of work in the Chappaqua NY, Bedford, Armonk area. But we service all over Westchester.